Fifteen years ago, teenager Alan Benning jogged off a beach—and into a nightmare. Because what awaited him in the Cape Cod woods was an unspeakable temptation, a moment of panic, and a brutal memory that would haunt him for the rest of his life. Anyone's My Name has appeared in numerous editions worldwide and has been taught in college courses on literature and criminology. Shubin’s novel The Captain was nominated for an Edgar Allan Poe Award, featured in the reference work 100 Great Detectives, and selected for a special citation by the Athenaeum of Philadelphia. The Chicago Tribune on WITNESS TO MYSELF: "A new example of classic noir." Booklist on WITNESS TO MYSELF: "Shubin...raises the stakes with such expert subtlety that sometimes we�ve read a whole chapter before we remember to breathe. A strong study of crime and character." The Washington Post on WITNESS TO MYSELF: "Narrated with...compassion, the account takes on a heart-pounding poignancy." Paperback Bazaar on WITNESS TO MYSELF: "Riveting and tragic...layered and complex...WITNESS TO MYSELF is one of the finest noir thrillers I have ever read." Bookgasm on WITNESS TO MYSELF: "Literally a pulse-pounder...demands to be read in a single sitting...the finest book Hard Case has issued so far, new or old." 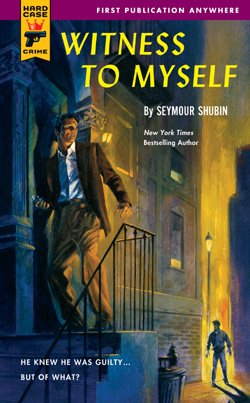 "Shubin is one of those making art of the mystery...a master of prose, one of the very best." "Grim and shocking...[Shubin] is a story-teller with a terrific punch."